"I was born and raised in Indianapolis, Indiana, which means I can't drive a tractor, but I won't eat veggies that come from a can. After high school, I tossed off to the U.S. Naval Academy where I earned my BS in Aerospace Engineering (Astronautics) and German (Ja!) then headed to the fleet as a weapons officer on a combat destroyer. After that I did a tour at the Center for Naval Leadership as an instructor, then resigned my commission to pursue my side hobby of populating the Church of Rome. For the next few years, I followed my navy husband around the country, our growing family in tow, until one day I sat down at the computer and let one of the stories in my head out. Telling my friends and family I was trying to be a serious writer was a bit like coming out of the closet. At first it was terrifying, but many of them just nodded and said they had always known I was a writer, they were just waiting for the day I could acknowledge it. I teach classes at The Muse Writers Center in Norfolk, Virginia, and I am also on the advisory board of Hampton Roads Writers. Honestly, no. Only in that "it would be cool to write a book someday" sense. I had some story ideas over the years and started to write them out, but they all fizzled pretty quickly (from life as much as anything else). When this one hit me, however, it really took on a life of its own, and I couldn't have stopped writing if I'd tried. I had no idea just how much freaking work came after that first draft, though. If I had, I might have chickened out. I love watching movies and TV shows with my kids - we're going through all the episodes of Star Trek Voyager at the moment. Otherwise I like to cross-stitch or do puzzles. They put my mind in order. Yes? I almost always have either on hand. The tea I make at home, but the coffee has to be a Starbucks latte because I can't make that magic myself. Sage's biggest weapon is her mind. She's not especially skilled with weapons, especially in the beginning, and she's not some sort of prodigy as she learns. But she never limits her ideas to the way things are done, and it's her ability to take seemingly unrelated events and make connections between them that saves everyone. Sage also believes knowledge is the key to bettering one's self, so she has a bit of an obsession with teaching others and learning more wherever she can. Yikes. 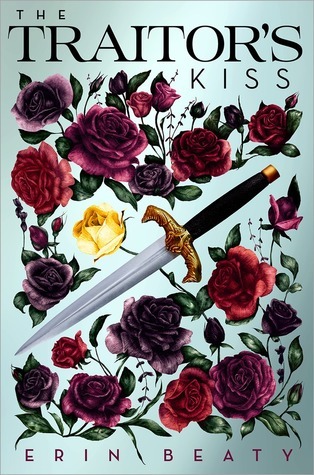 The Traitor's Kiss is my first novel ever, so I'm not quite sure I have a writing process. I did learn what worked for me, which is plotting on a big board with post-its then writing a whole bunch, then re-working the post-it chart, then writing... over and over until it's done. The first draft of the second book came out much stronger than the first time around because I didn't make all those rookie mistakes, like head-hopping. Now that I have to produce books on a deadline, I'm much more likely to power through those times I just don't feel like writing. Sometimes the Muse is late, but she almost always shows up. Right now I'm partway through the Emily King's The Hundredth Queen (so lovely! I don't want it to end), a G.K. Chesterton reader for Lent, and Randall Munroe's What If?. My TBR stack keeps getting thrown out of whack by time-sensitive reads, like ARCs and Critique Partner stuff, but those are good problems to have, right?